It is 1967. I was seven. My mother was asleep in the front seat, her head cocked back on the headrest. My younger sister was belted and tucked into the middle seat. My brother and I were in the back of the station wagon, whose seats had been flattened to make a platform, upon which we dozed under blankets knitted by my grandmother Desolina, whom we were going to see. 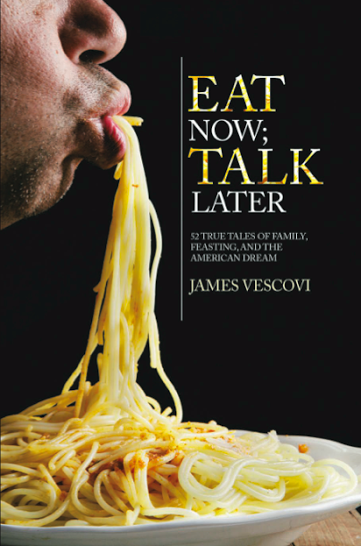 Synopsis of Eat Now Talk Later by James Vescovi: Prepare yourself for a feast consumed in delicious bites. This collection of stories can be read before bed, on a lunch hour, or waiting in line. They can even be shared with friends who complain they have enough to read. Together they ask the question, "How do you make modern life run smoothly for parents or grandparents who grew up in an era when oxen were used for plowing, children left school after third grade to tend chickens, and meat was eaten only twice a year? When Tony and Desolina Vescovi arrived in America, they collided with the 20th century. Born around 1900, they were stumped by telephones, banks, fast food, TV wrestling, and supermarkets. It was up to their only child, a son, to serve as their shepherd, and it wasn't easy For example, how to explain that his job was taking him and his family 700 miles away when, in their day, sons stayed put to work the family farm? Or that it wasn't wise to hide $10,000 in the bedroom? Or that the ice cream they just tried and enjoyed is called 'Chubby Hubby'? This collection of 52 bite-size stories offers a twist on the American immigrant tale and is a testament to love, loyalty, and frequent half-truths. Sorry but that's not a very appealing cover.... lol... kinda grossed me out. That cover is not appealing but I liked the quotes! After reading, I'm excited to give this a look.